Sonias Cosy Cottage provides self catering accommodation in Hennopspark, with secure undercover parking, a private entrance and situated close to amenities. We are 5km away from Unitas Hospital and have easy access to highways and are close to Centurion Mall. After a long and tiresome journey, come and relax before your next hectic schedule in the comfort of your own private cottage. 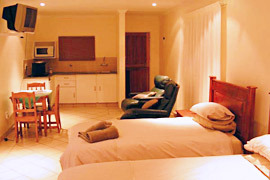 We offer you a self catering unit with private and secure entrance, where you will feel at home away from home.